SACRAMENTO-The trap was set and the gendarmes were in position. Inside Amsterdam’s HOLLANDISHE BANKE plainclothes police posed as bank employees. Not wanting to tip their presence the police arrived early … seeded with the morning commute. Outside, the “uniforms” were also in position. Told to be close, but “not” visible … marked radio units said they were in place. Still … the on-scene commander was uneasy. Alerted about suspicious money transactions only the night before … he didn’t have a lot of information. Spying on arriving customers investigators were looking for AIME NASSIF, a Lebanese swindler, said to be scheming with U.S. and European mobsters in an audacious plot to steal $3.5 million from the City of Los Angeles. Funds from a stolen warrant had already been wire transferred overseas totaling more than $902,000. Initially deposited with the CROCKER INTERNATIONAL BANK, in New York City, funds were first credited with the BANQUE DE PARIS, in Geneva, and then transferred to the Amsterdam bank. The warrant was first presented to the treasurer’s office for payment and then marked “paid,” before the transfer was made. Inside the Amsterdam bank officials credited the funds to an account marked, “NASSIF – COPENHAGEN.” News accounts said the account had been dormant for five  years. INTERPOL, the famed police organization headquartered in Lyons, France said NASSIF, age-53, was an international money swindler. With funds still on deposit totaling almost $93,000 police thought NASSIF would return to the bank. During a 3-day period beginning December 2nd, he had already withdrawn $810,000 requesting Dutch, British, Danish and U.S. currencies. Authorities were alerted to the scheme when PHILIP MANUEL, chief investigator for the U.S. Senate Permanent Subcommittee on Investigations, said he was told mobsters wanted to cash three  stolen warrants totaling $2.5 million. Sharing information with local authorities, he said BERNARD ROBERT HOWARD, a Yonkers, NY accountant, age-52, approached an informant wanting to cash the checks, stating he wanted the proceeds laundered “offshore.” Speaking to the informant, HOWARD asked about using banks in the Bahamas, Switzerland and Canada. Investigators said HOWARD was affiliated with several crime figures, citing an unnamed mafia figure in the Tampa – St. Pete area and a Los Angeles City “insider” not further identified. MANUEL identified the informant as MICHAEL RAYMOND, a twice convicted bank cheat with numerous arrests and incarceration for stock fraud. Seeking fees and reimbursement totaling $1.1 million the BANQUE DE PARIS said city officials had acted improperly. Transferring funds only after the treasurer’s office marked the warrant as being “paid,” attorneys said officials acted inappropriately not doing anything to alert institutions 18 warrants had been discovered missing, months earlier, in March 1974. Asked why officials didn’t notify police, CHARLES NAVARRO, the Controller for the City of Los Angeles, said the city thought the warrants had been “misplaced,” and only recently realized they were stolen. Setting up the scheme, HOWARD initially proposed taking delivery of the cash in Montréal, but prosecutors “nixed” that idea. They wanted to make an arrest in California. Prosecutors were feeling the heat with news accounts saying city officials acted improperly. Investigators told RAYMOND to change the plan. Accordingly, RAYMOND warned HOWARD he was taking undue risk transporting $1.2 million across the Canadian border and suggested meeting in Beverly Hills at the BEVERLY WILSHIRE. RAYMOND’s involvement was “not” without cost to the city. Los Angeles Mayor TOM BRADLEY testified he authorized paying a reward to RAYMOND totaling $45,000, but only after he learned RAYMOND wanted $125,000. Told about the scheme just before the Thanksgiving, in 1974, he said he put a $50,000 limit on any payment, telling investigators to negotiate the amount and suggested offering $25,000. Following his arrest HOWARD said the plot to steal millions originated with RICHARD KEATS, age-39, a Ft. Lee, New Jersey resident and a former drug store owner in Beverly Hills and Palm Springs, California. He said KEATS gave him the warrants after he made arrangements with RAYMOND to get them cashed, insisting the proceeds be laundered offshore, using banks in the Bahamas and Europe. On January 10, 1975, the Los Angeles County District Attorney’s Office charged KEATS, HOWARD and FREEMAN in a 10-count Grand Jury indictment with orchestrating a $3.5 million fraud scheme alleging conspiracy, forgery and attempted grand theft. A readymade plot for the silver screen, prosecutors said KEATS was stopped by customs officials, on December 6, 1974, near Montreal, carrying $150,000 in “cash,” stuffed in a suitcase and $14,000 in jewelry. Not aware of the theft, custom agents allowed KEATS to enter the country, but only after they counted the money. Not having an appraisal border officials kept the jewelry for an evaluation. Investigators said custom agents were “not” told about the ruse or about HOWARD and FREEMAN being arrested. Having made bail, learning about the indictment, KEATS fled the United States. Authorities said he was with NASSIF in Amsterdam, when NASSIF withdrew $810,000 in Dutch, British, Danish and U.S. currencies. Caught “red-handed,” facing 33-years in prison, the Government refused to give HOWARD a break in plea negotiations. At his preliminary hearing, RAYMOND testified it was HOWARD who approached him wanting to cash the stolen warrants valued at $2.5 million. But authorities remained clueless about the missing money transferred overseas. Despite the elaborate surveillance plan in Amsterdam, NASSIF evaded police and authorities had no idea where the elusive KEATS was located. Claiming they were not responsible city officials refused to pay the Swiss bank’s demand totaling $1.1 million. Listening to prosecutor’s opening remarks, in July 1975, HOWARD thought his best chance might to ask for the court’s mercy. Surprising court observers, ending his trial, he plead guilty to attempting to defraud the City of Los Angeles funds totaling $856,726. Prosecutors said the stolen warrant had been made payable to the MERCANTILE TRADING CORP OF CHICAGO. With a criminal record that included two felony convictions, and prosecutors demanding a maximum prison term, HOWARD knew his chances were not good for getting a reduced sentence. Awaiting trial, FREEMAN, likewise, decided to “cooperate,” identifying JOYCE R. LEWIS, the owner of the MELODY MOTEL, in Los Angeles, as the individual who approached him wanting to cash the stolen warrants. LEWIS was on federal probation, convicted in another check scheme, charged with Interstate Transportation of Stolen Property (ITSP) in Chicago. Testifying at FREEMAN’s preliminary hearing, LEWIS denied saying anything about the stolen city warrants. But cops said they had the right suspects, since she boasted to friends about scoring big in a check scheme. Talking about the scheme, FREEMAN said LEWIS also met privately with another man whom she introduced as Mr. GREEN, claiming he was a city employee. After their meeting, FREEMAN said LEWIS asked him whether he knew anybody who could get rid of some checks. Because the question reminded him of an earlier conversation with RICHARD KEATS, in New York City, he called KEATS. He said KEATS thought he could pass the checks, but wanted more information. FREEMAN told LEWIS and GREEN about his conversation, recalling they talked about writing checks for amounts totaling $40,000 to $50,000 a piece. But learning the city frequently paid out larger amounts, they decided on writing checks for larger amounts. FREEMAN said GREEN indicated he was working with someone inside the data processing center, but didn’t identify them. Splitting the proceeds they agreed to a seventy/thirty split with KEATS keeping most of the money and LEWIS and GREEN keeping thirty-percent [30%]. Asked to explain the mechanics behind writing each check, FREEMAN said KEATS was the ringleader stating he ordered three warrants be filled out for amounts totaling approximately $800,000 a piece, with the fourth check, totaling approximately $902,000 made payable to the CROCKER INTERNATIONAL BANK in New York City. He said he gave the information to GREEN who got the checks issued and printed and then air-freighted the warrants to KEATS concealed in a jacket. FREEMAN thought all four checks were going to be cashed overseas and couldn’t explain why three warrants were cashed in the United States, and the fourth check totaling $902,000 collected overseas. He said he didn’t know until much later, the data processing center didn’t issue the checks, but rather LEWIS and her associates stole blank warrants, using a simple typewriter to fill in amounts and make the checks payable. Unaware plans had changed, he said LEWIS and he traveled separately to Montreal expecting to collect money. Using the name MICHAEL PHILLIPS, he stayed at the CHATEAUBRIAND HOLIDAY INN and said LEWIS was accompanied by two other associates whose identities he didn’t know. Reporting on the story, the Los Angeles Times said hotel records for the period December 2nd thru the 5th reflected an individual named MICHAEL PHILLIPS was registered at the CHATEAUBRIAND. And records at the AIRPORT HILTON reflected an individual named J. LEWIS was registered, accompanied by AKINA MORALES and another individual named A. WOODLEY. Citing his arrest, he said neither he nor LEWIS collected any money. FREEMAN denied knowing anything about the fourth [4th] warrant being cashed, with funds being initially credited to the BANQUE DE PARIS in Geneva and later transferred to the HOLLANDISHE BANKE in Amsterdam. He also denied knowing anything about NASSIF, the Lebanese swindler, who withdrew $810,000 in cash, requesting Dutch, British, Danish and U.S. currencies. Not in contact with LEWIS since his arrest, having agreed to cooperate with authorities, FREEMAN telephoned LEWIS. In an effort to get her to talk “openly” about the scheme, he told her to go to a public telephone so they could talk. Once in contact, LEWIS spoke freely about the scheme saying she gave GREEN $15,000. Once the scheme blew up, she said he went to Texas where he hid for 4 ½ months. Still in contact, she said she spoke with him only days ago, on Sunday, when he indicated he was returning to Texas. Asked why she gave GREEN the money, LEWIS said she had to pay his expenses going to Montreal. Looking at a police photo-lineup, FREEMAN identified GEORGE H. RICHARDSON as the person LEWIS introduced to him as Mr. GREEN and the person who gave him the stolen warrants. He said LEWIS indicated GREEN worked in the city’s data processing department, but cops disproved that notion. He said it was RICHARDSON who had the contact inside the data center and the person who stole the warrants. A fugitive for almost a year, using the name BENJAMIN MARCUS, immigration officials said KEATS was arrested attempting to enter the United States in Puerto Rico. Held in lieu of $500,000 bail, he was turned over to FBI in San Juan. Prosecutors said KEATS was the “mastermind” behind the plot, saying he orchestrated the money transfers to the BANQUE DE PARIS and HOLLANDISHE BANKE totaling more than $900,000. PHILIP MANUEL, the Senate investigator whose informant cracked the case, said NASSIF belonged to a select group of sophisticated international swindlers whose numbers he estimated totaled about 1000 individuals. He said the group had the ability to launder money anywhere in the world with their operations frequently funded by members of Organized Crime [OC]. Setting up the scheme, he estimated mobsters paid $100,000 to set up the scheme. Using several foreign bank accounts to orchestrate the money transfers, in particular the bank account set up by NASSIF in 1967, he described the case as a Mafia page turner. Initially sentenced to 14-years in prison, Los Angeles Superior Court Judge LESLIE LIGHT later reduced FREEMAN’s incarceration time to time served, crediting him with providing critical testimony that resulted in LEWIS’ prosecution and conviction. News accounts said LEWIS was sentenced eight  to ninety-four  years in prison. Still wanting to identify the city “insider,” cops finally got a break when authorities said they arrested GEORGE H. RICHARDSON, age-42, in Mobile, Alabama. Police said an anonymous tipster told them he was “wanted” in California on a check fraud case giving cops his location. Refusing to cooperate, charged in a 10-count indictment, following a weeklong trial, he was convicted on charges including conspiracy, forgery, attempted grand theft and receiving stolen property. Meeting CORNAZ in Frankfurt, Germany, the undercover agents said during discussions with CORNAZ and KITZER the two men acknowledged their roles in the scheme stating they helped KEATS cash the stolen warrant totaling more than $900,000 with each keeping $300,000. The duo guffawed about KEATS being prosecuted for the crime, getting a 20-year prison sentence, but authorities never recovered the money and neither KITZER nor CORNAZ were prosecuted for the crime. Cackling … KITZER said he walked into CORNAZ’s office when he was being questioned by the Swiss Federal Police. Sensing trouble he said, he asked police for directions to the train station and quickly left. He said police just thought he was a lost tourist. Both KITZER and CORNAZ laughed “wildly,” saying Swiss police didn’t realize they knew each other. Given the admissions made to the undercover agents, the FBI disseminated the “new” information to Swiss authorities and M. JACQUES FOEX, an Examining Federal Magistrate in Geneva reopened his inquiry. Recalling the case, FOEX later told the agents he ordered NASSIF’s initial arrest, adding the case also involved JEAN CLAUDE CORNAZ and his son, PASCAL. He said NASSIF implicated KEATS and several associates, but denied the involvement of the two CORNAZs. Lacking evidence he said the two CORNAZs were never prosecuted. For his part in the scheme, in lieu of bail, FOEX said NASSIF was placed on provisional liberty and his movements were restricted. Reopening their case FOEX travelled to the United States to collect evidence and take testimony from witnesses. Before charges could be returned, however, FOEX said JEAN CLAUDE CORNAZ suffered a massive heart attack leaving him paralyzed and in a diminished intellectual state. Accordingly, prosecutors decided against further proceedings. FOEX described CORNAZ as “a shadow of his former self.” He also said prosecutors were not interested in pursuing charges against PASCAL CORNAZ. Traveling with KITZER in an undercover capacity in 1977, WEDICK said he and BRENNAN learned KITZER and CORNAZ were members of a select group of international swindlers similarly talked about by MANUEL whose numbers he said totaled approximately 1000-individuals and capable of stealing and moving money anywhere in the world. KITZER repeatedly referred to the group as “The Fraternity,” adding they were a select group of international swindlers. KITZER first came to the attention of the Justice Department, in 1965, when he and 16 others including the Illinois State Insurance Commissioner CYRUS MAGNUSSON were charged in an indictment with defrauding $4.5 million from policy holders in a criminal case concerning the AMERICAN ALLIED INSURANCE COMPANY in Minneapolis – St. Paul. KITZER owned the insurance company. Incredibly, following a 14-week trial that concluded in Bismarck, North Dakota, the Justice Department lost the case. Court observers said it was KITZER’s dramatic testimony that brought about the government’s stunning defeat. Information about KITZER and his connection to Organized Crime [OC] and the journey of the two undercover agents can be found in the upcoming book, “CHASING PHIL: The Adventures of Two Undercover Agents with the World’s Most Charming Con Man,” written by DAVID HOWARD and published by CROWN with release now scheduled in October 2017. HOWARD writes in “CHASING PHIL,” readers become traveling companions [almost], witnessing the efforts of two undercover agents, as they try to convinced FBI executives using sophisticated long term undercover operations in the Bureau’s White Collar Crime [WCC] program is an effective method to investigate and prosecute Organized Crime [OC] figures. Introduced to KITZER on a cold February night in Minnesota, readers are soon whisked to warmer climes, where agents find themselves at the famed Fontainebleau Hotel, in Miami Beach; the old Governor’s Mansion, in the Bahamas; and later the Ala Moana Hotel, in Waikiki Beach, Hawaii; meeting with mobsters, powerful politicians and crooked businessmen, all wanting to use KITZER’s network of offshore banks to launder money and issue bogus securities. Traveling the globe with KITZER, readers learn about the special relationship he has with the undercover agents, playing the roles of protégés and co-conspirators, introducing them mobsters in New York, as they marshall the FBI into a new era in which White Collar Crime [WCC], Organized Crime [OC] and National Security become the Bureau’s top three investigative “priorities. Code named, “OPFOPEN,” Major Case #1; Office of Origin: Indianapolis; the case spawned a number of other prominent investigations including the FBI’s ABSCAM case resulting in a number of Congressional figures being charged and prosecuted on bribery violations. Also under development, WARNER BROS PICTURES has secured rights to the book wanting to produce a full length feature film with ROBERT DOWNEY JR. producing, possibly starring as PHIL KITZER. © 2016 JAMES J WEDICK. All rights reserved. With the FBI for almost 35-years whose experiences include being an FBI undercover agent and later responsible for the FBI’s corruption squad in Sacramento, California, Mr. WEDICK’s career includes initiating the FBI’s “OPFOPEN” investigation that targeted globe-trotting conmen and Organized Crime [OC] figures using “offshore” banks to launder money, issue bogus securities and conduct fraudulent transactions; undercover roles in the ABSCAM probe where members of Congress were prosecuted for soliciting bribes; and investigating and prosecuting the sons of New York mobster JOE BONANNO in operation code named, “SKINBURN,” for defrauding businesses in California and Utah several hundred thousand dollars. In 1996-97, amid allegations suggesting Fresno area officials were seeking “bribes,” in exchange for favorable zoning changes, in Bureau operation code named, “REZONE,” Mr. WEDICK prosecuted 17-defendants, including county officials, lobbyists and businessmen … all charged with violations of RICO and corruption statutes … again securing convictions. NY Times article captioned, “Informant Named in Coast Swindle,” dated December 25, 1974. And LA Times article captioned, “LA Check Fugitive’s Border Incident Told,” written by WILLIAM FARR, dated January 22, 1975 page 25. LA Times article captioned, “Swiss Bank Seeks $1.1 Million From LA,” written by WIILIAM FARR, dated March 13, 1975, pages 3 and 25. NY Times article captioned, “Funds From Los Angeles Check Forgery Taken Out of Dutch Bank, written by ROBERT A. WRIGHT, dated December 17, 1974 and article captioned, “Informant Named in Coast Swindle,” dated December 25, 1974. NY Times article captioned, “Informant Named in Coast Swindle,” supra. LA Times article captioned, “Check Case Suspect Pleads Guilty,” continued from page 1 [On microfilm see page 149], supra. NY Times article captioned, “Informant Named in Coast Swindle,” dated December 25, 1974. Working with the Senate panel and Justice Department officials investigating corruption, RAYMOND testified, in July 1971, he paid New York Supreme Court Justice MITCHELL D. SCHWEITZER “bribes” totaling $50,000. Justice SCHWEITZER denied the charges, but retired in 1972 stating he wanted to avoid the “stress and strain” of a judicial inquiry. He also implicated two Boston judges involved in bribery schemes identifying them as Justices EDWARD J. DESAULNIER JR. who was ruled “unfit” to sit as a judge and be a member of the bar and Justice VINCENT R. BROGNA who was “censured.” See NY Times article captioned, ” Informant Named in Coast Swindle,” supra. LA Times article captioned, “Check Case Suspect Pleads Guilty,” dated July 4, 1975, continued from page 1 [On microfilm see page 149]. On January 17, 1959, RAYMOND was sentenced to 3-years prison for defrauding a Florida citrus owner funds totaling $16,000 and crossing state lines in violation of the federal statute known as Interstate Transportation of Stolen Property [ITSP], Title 18, United States Code [USC], Section 2314. See NY Times article captioned, ” Informant Named in Coast Swindle,” supra. In 1964, RAYMOND was indicted by the Federal Grand Jury [FGJ] for using fraudulent checks to purchase securities valued at $84,000 and, in 1966, was found in possession of stolen securities taken from a Wall Street messenger totaling $1 million. NY Times article captioned, “Informant Named in Coast Swindle,” supra, page 2. LA Times article captioned, “Bradley Testifies at Checks Trial,” written by WILLIAM FARR, dated November 26, 1975, page 23. LA Times article captioned, “LA Checks Fugitive’s Border Incident Told: Held on Dec 6th with a $150,000 in Suitcase, Released 4-Hours Later,” by WILLIAM FARR, dated January 22, 1975, page 3. 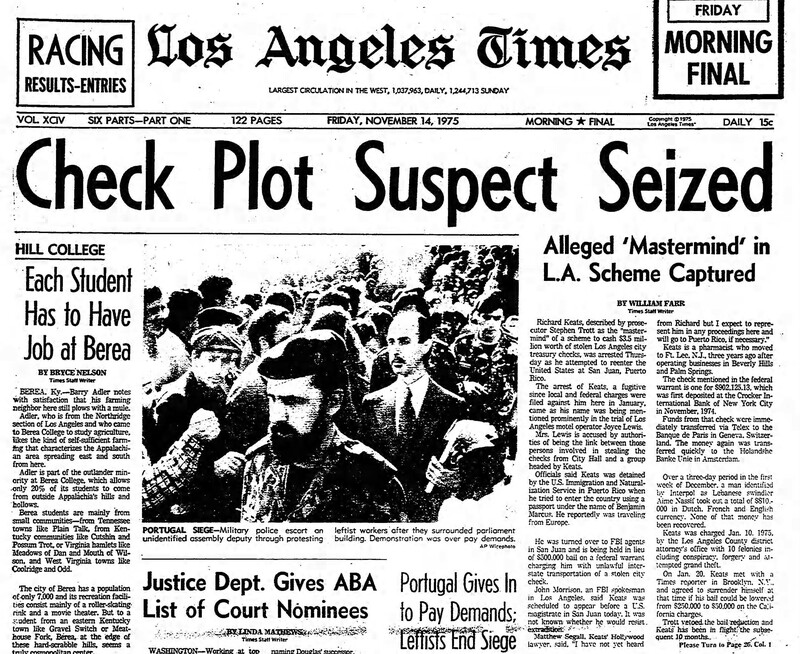 LA Times article captioned, “Check Plot,” dated June 22, 1975, continued from page 1. LA Times article captioned, ”Swiss Bank Seeks $1.1 Million From LA,” written by WIILIAM FARR, dated March 13, 1975, pages 3 and 25. LA Times article captioned, “Check Case Suspect Confesses,” dated August 22, 1975, continued from page 1, page 24. LA Times article captioned, “Key Suspect in LA Check Case Seized: Man Arrested in Alabama May be Able to Name City Hall Contact,” written by WIILIAM FARR, dated September 17, 1976 page 6. LA Times article captioned, “Check Case Suspect Confesses,” supra, page 24. LA Times article captioned, “Check Scheme Payoff of $15,000 to Contact Inside LA City Hall Indicated,” written by WILLIAM FARR, dated August 25, 1975, page 24. LA Times article captioned, “Check Scheme Payoff of $15,000 to Contact Inside LA City Hall Indicated,” supra, page 24. LA Times article captioned, “Key Suspect in LA Check Case Seized: Man Arrested in Alabama May be Able to Name City Hall Contact,” supra, page 6. LA Times article captioned, “Check Scheme Payoff of $15,000 to Contact Inside LA City Hall Indicated,” supra. Associated Press [AP] story captioned, “Thief Still Lurking in LA Government,” written by STEPHEN FOX, dated July 24, 1975, that appeared in the Independent, Long Beach, California, page A-22. Independent and Press-Telegram article captioned, “Judge Frees Man, a Key Witness, in LA Check Case,” dated February 18, 1976, page 32. THE MINNESOTA JFK CONNECTION: David Kroman and the American Allied Insurance Scandal by RON WILLIAMS.